So last time I reviewed J Michael Straczynski’s season 1 episode “Take Two”. It was a super meta episode about Hollywood making a movie about the cartoon Ghostbusters that included actual footage from the Ghostbusters movie. Next up is another super meta episode by Straczynski involving the cartoon Ghostbusters and the aftermath of the actual events in the first movie. Season 1 – Episode 11. Citizen Ghost. I wanted to watch this episode because, as I alluded to, it’s supposed to be a direct sequel to the original 1984 movie. Peter is interviewed by a reporter for a news story. Peter tells the story about how Slimer came to be the mascot of the Ghostbusters. This involves flashing back to immediately after the first movie fight against Gozer. So we flash back. Gozer has been defeated, but the GBHQ is still destroyed from when Walter Peck had shut down the containment grid and the ghosts escaped. You see the holes created by the escaping ghosts. We see the Ghostbusters are still in their all gray movie suits. Egon mentions that they need to destroy these suits due to all the ectoplasmic radiation they absorbed in their fight with Gozer. Janine announces that luckily right before their fight with Gozer they got delivery of their brand new uniforms. We see the guys pull out their new, more colorful, cartoon versions of the Ghostbusters suits. I love that already this cartoon is explaining why the cartoon’s suits are different than the movie. Peter is in charge of destroying the irradiated uniforms. He kicks the box aside and completely forgets about it. The box slides right up next to the new containment unit and starts absorbing some ectoplasmic radiation that happens to be leaking from it. The irradiated suits absorb so much ectoplasmic energy that they start glowing and get up and walk out of the box! The suits generate ghostly versions of the Ghostbusters that shoot ectoplasm out of their proton packs. The fellas must fight their ectoplasmic doppelgangers with the help of Slimer who, instead of escaping with the other ghosts during the movie sequence, decided to stick around the headquarters with the guys. Slimer ultimately helps defeat the spectral Ghostbusters. This is a fun episode that attempts to explain the several differences between the movie and the cartoon. And they are pretty good explanations. I liked this episode quite a bit. I’m surprised this wasn’t used as the very first episode right out of the gate. Also, evil spectral Ghostbusters. You know I’m all over that. Several episodes of my podcasts have been posted lately. Episode 125 of the Nerd Lunch Podcast was posted last week to much acclaim. It features the final week in our Atomic Weeks celebration in which we are celebrating the Atomic Geeks’ 250th episode by having each member of the show as guests. 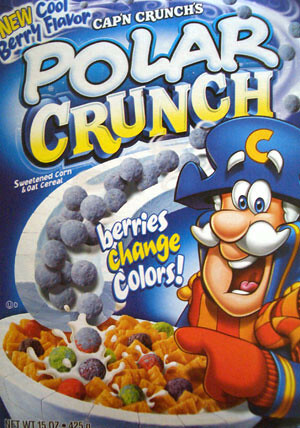 This final week has Digio as our guest and we are talking about breakfast cereals. 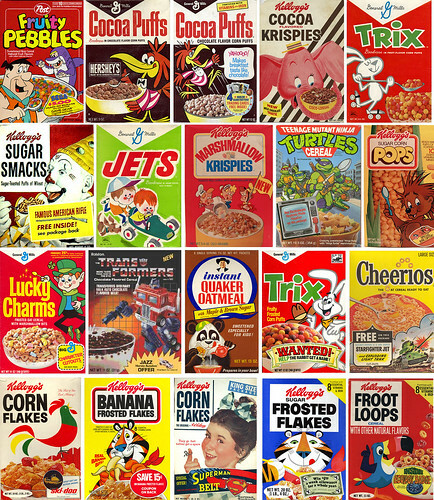 We talk about our favorite cereals, mascots and commercials. 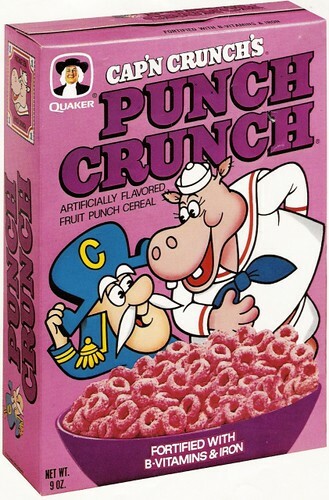 We even take a moment to create our own cereal based on a pop culture property. It’s a fun episode, check it out on iTunes, Stitcher or listen to it online here. This week, episode 126 features a crossover between Cult Film Club and the Nerd Lunch Podcast. You may remember that all of us met up in Atlanta last month. While we spent our time eating and drinking our way through the city, we did actually sit down and record a podcast. And it has now gone live. It’s our annual Summer Preview episode where we all talk about movies that we are excited to see in the coming months. It’s a lot of fun. Check it out on iTunes, Stitcher or listen to it online here. And, in a bit of synergy, Shawn, Jaime and I have finally started recording Season 2 of the Cult Film Club podcast. 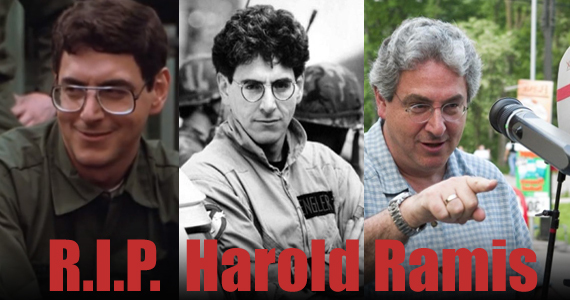 The first episode is up in which we pay tribute to the great Harold Ramis by looking at three of his most famous and cult-y flicks; Stripes, Ghostbusters and Groundhog Day. So click the RIP image above and listen to the awesome Episode 13 of The Cult Film Club Podcast. Oh yes, and this is my 800th post on the Cavalcade. You’re welcome, Internet. If you read this blog you know I love both movies and promotional food stuffs like new soda flavors and candies. I love it even more when they are combined. Here are some candies, pastries, etc that were re-branded to promote a movie. I’m going to exclude the Star Wars saga from this article because, honestly, I could do a series of articles on Star Wars and food branding. Images are from my own Flickr stream unless otherwise noted. See all images BIGGER by clicking on them. 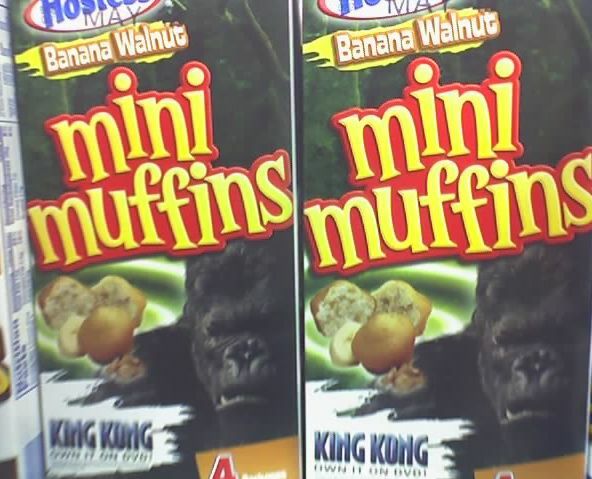 King Kong Hostess pastries – Back in 2005, Hostess did a big promotion for Peter Jackson’s King Kong remake. They added banana to several of their products. In the pics you can see Banana Twinkies as well as Banana Walnut mini muffins. 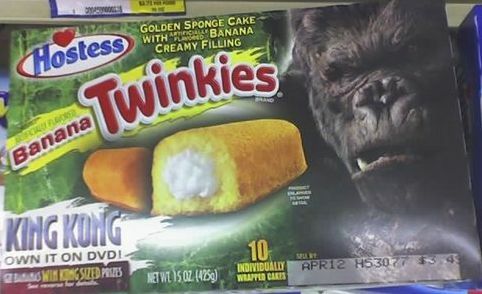 Interestingly enough, Twinkies’ original flavor was, in fact, banana. 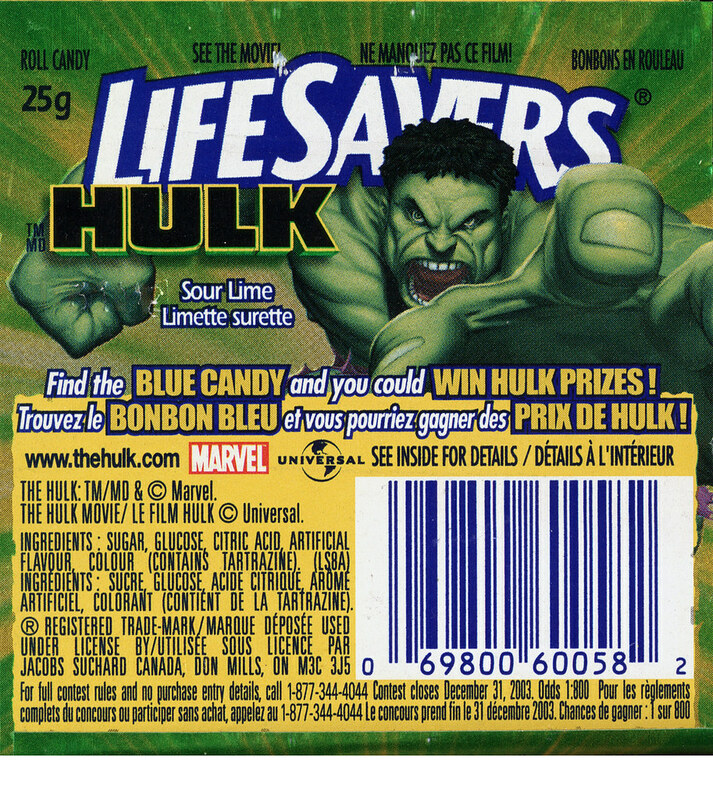 Hulk Sour Lime Life-Savers – A Hulk branded Sour Lime flavor promoting the 2003 Ang Lee Hulk movie. I don’t actually remember these at all, I just saw the wrapper pop up on my buddy Jason Liebig’s Flickr stream. Jason states that it may have been a Canadian only product. I like this much better than I liked Ang Lee’s movie, and I haven’t even tried these. Hostess Teenage Mutant Ninja Turtle Pies – From 1991. This was sort of a dual promotion. 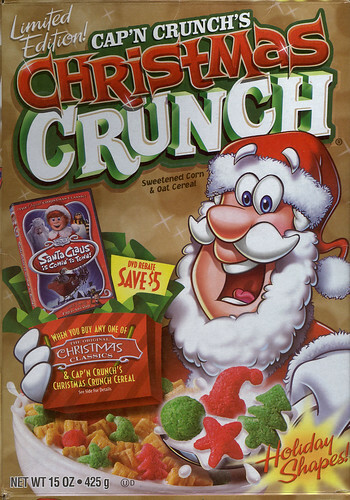 The packaging used artwork from the cartoon, but it was released around the time of the second live-action movie. You can even see a movie promotion on the packaging. Matt from X-Entertainment did a great write up of this product. The pies were green and filled with vanilla pudding. There were four package designs each featuring a different Ninja Turtle. Hostess Hulk Cakes – From 2008 to promote the Incredible Hulk reboot with Edward Norton. 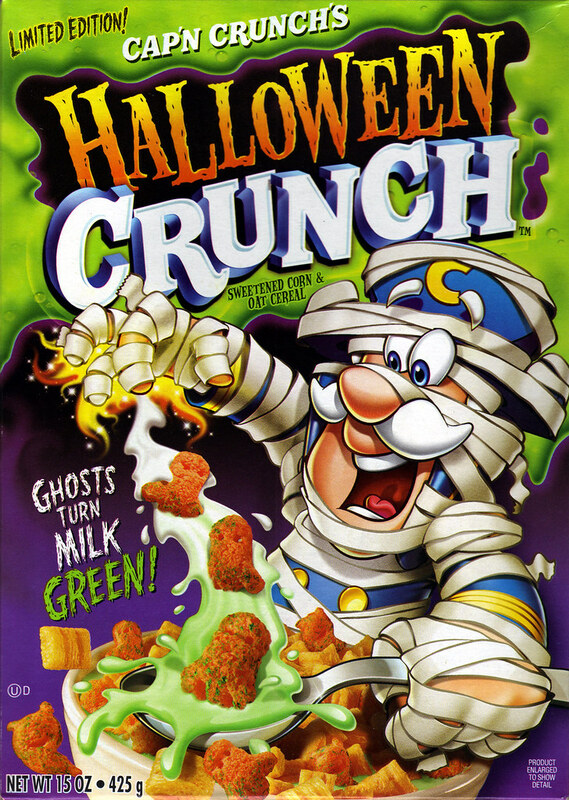 These were a Scary Cakes promotion for Halloween that featured green frosting and sprinkles on top. 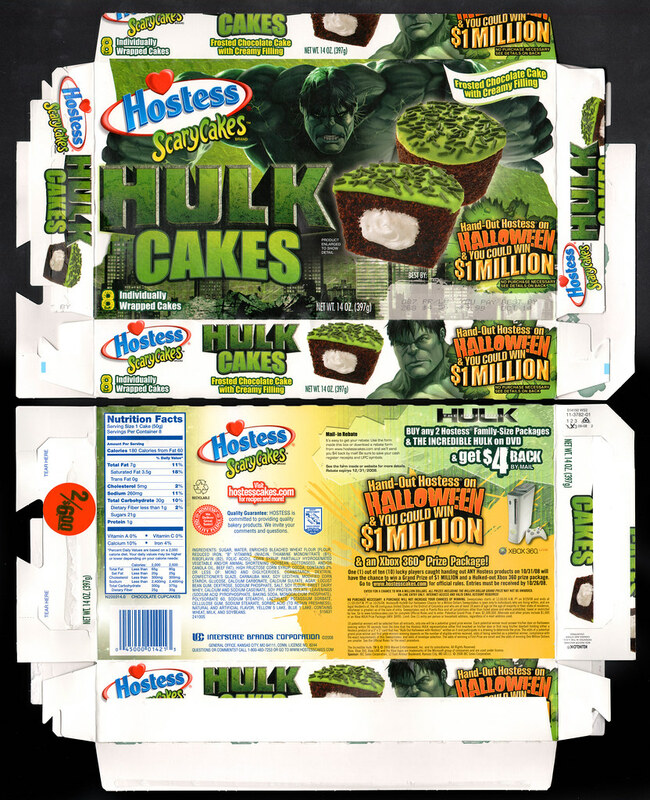 Hostess also added the Hulk to their regular cup cakes, donuts and Twinkies products, but left the actual cakes unchanged. There was also an Incredible Hulk branded Air Heads candy. 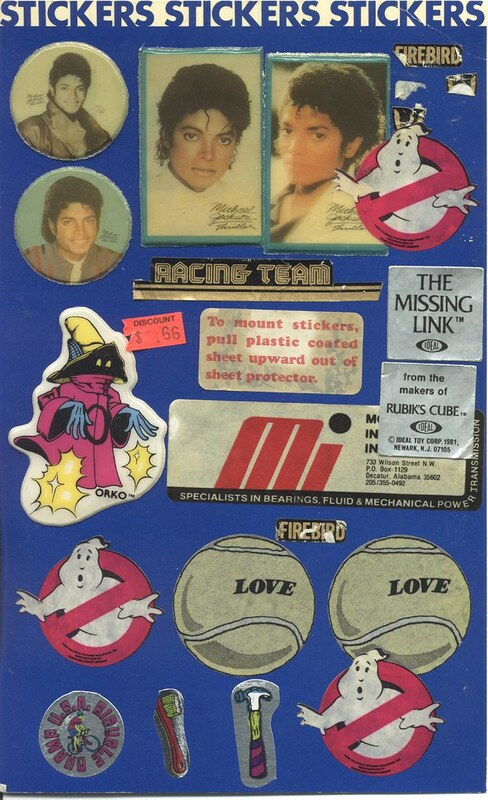 Shawn over at Branded in the 80s has a great feature called Peel Here that showcases his amazing 80s sticker collection. I was cleaning up my garage a while ago and found my own sticker collection in one of the boxes. It was complete with even some extra pages full of stickers stuck inside, plus my collection of bumper stickers and tons of my old Garbage Pail Kids. So, in the tradition of Shawn’s Peel Here I thought you’d like to take a look inside a mid-1980s elementary school sticker collection. It could be awesome, it could be totally embarrassing. Today I’ll look at the main sticker collection. Later I’ll take a look at my collection of bumper stickers and finally I’ll go through a bunch of the Garbage Pail Kids. 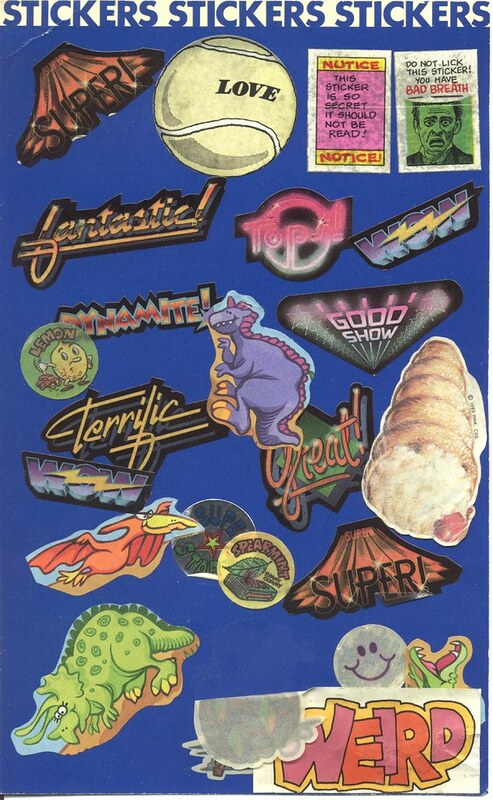 So, without further to do, let’s see the types of stickers I liked to collect in elementary school. You can click all these images to see them bigger in Flickr. Here’s the cover of my sticker album. I honestly can’t remember where I got this sticker binder. It was probably a gift from my mom or my grandmother. 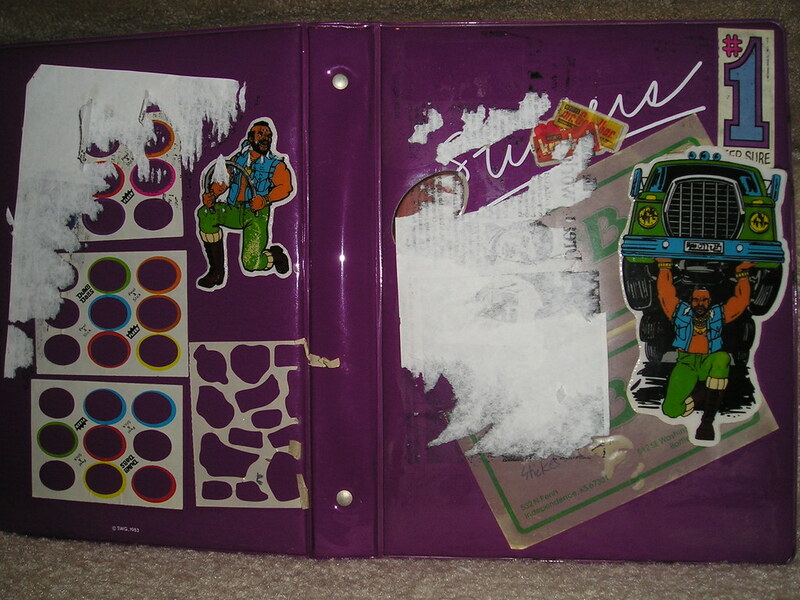 I covered up it’s puffy, purple-ness with badass, macho Mr T stickers. The Mr T stickers are pretty awesome. They feature Mr T doing manly things like bending a steel pipe with his bare hands and lifting up a f**king semi over his head. But, for some reason, they are…puffy stickers. 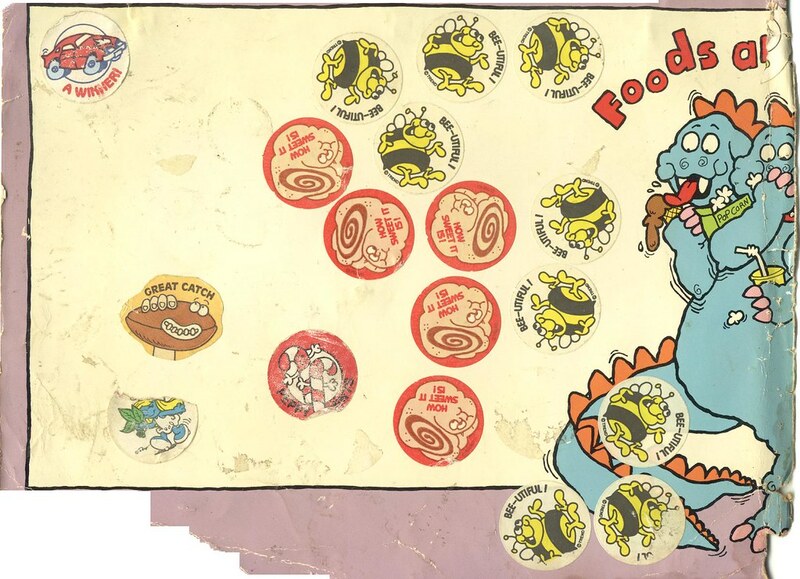 Puffy stickers were the girly cousin of regular stickers. Mr T puffy stickers are like painting a Corvette pink. WTF? If you ask me, the makers of those stickers are sending mixed messages to kids. I don’t remember what the giant white ripped sticker on the cover was before I tore it off. I apparently changed my mind about liking that particular sticker. I was a fickle elementary school child. The faded white stickers with the green border under all that mess were for Mr B’s delicatessen. It was located in Independence, KS and owned by my aunt and uncle. 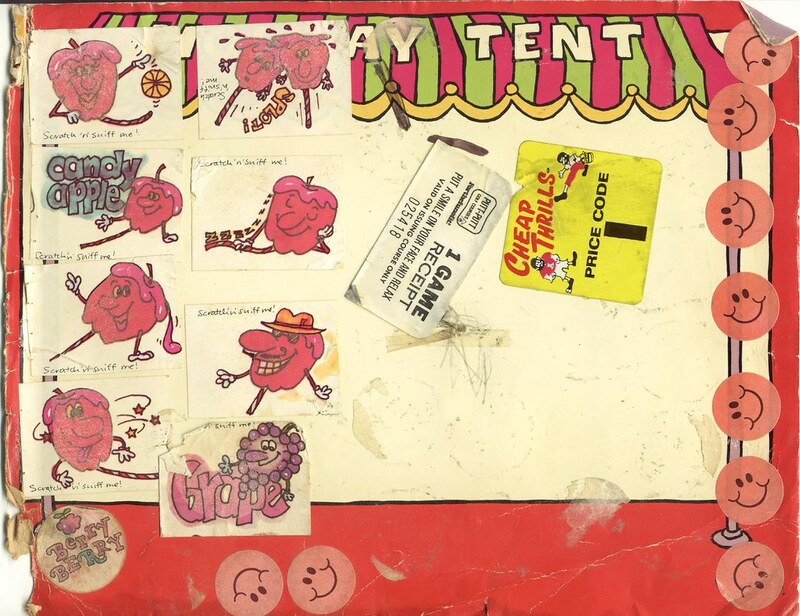 Let’s look inside this awesome tome of sticker archeology. First up is a separate page (front and back) of stickers I had shoved into the binder. These are not a part of the actual sticker album. I think I acquired them separately in a trade. They mostly consist of “scratch and sniff” stickers. You can see candy apples in the right hand page and cinnamon rolls and bumble bees in the left hand page. Okay, these pages are slightly embarrassing. Not exactly the type of stickers I remember liking. “Scratch and sniff” stickers of cinnamon rolls and candy apples are about as manly as pink fluffy toilet seat covers. That is to say, not very. The yellow “Cheap Thrills” sticker and the white Putt-Putt sticker in the right hand page are mine. Cheap Thrills was a “mom and pop” record store a friend of the family owned in Birmingham, AL. The sticker was a price sticker used on LPs. 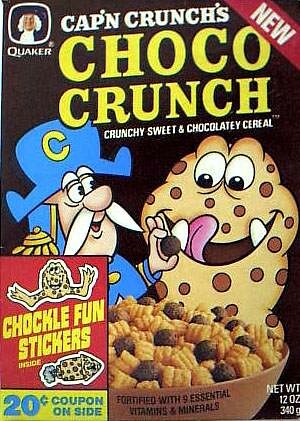 We had huge rolls of these stickers at home. 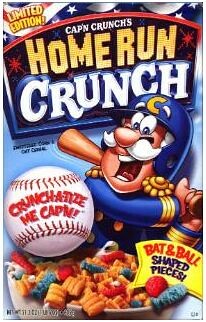 I remember putting them on nearly every surface in the house. Lightswitch covers, walls, furniture, pets. They were EVERYWHERE. The Putt-Putt in which I obtained the white sticker was located in Hoover just off Hwy-31. It turned into a Krispy Kreme a few years later, but I think even that is closed now. The sticker appears to be a 1 free game coupon. I must have got a hole-in-one. I wonder why I never used it. Here’s the front and back of the first page in the sticker album. It’s actually not a page, but a clear plastic case that would hold the actual page. I don’t know what happened to the page. However, I needed the real estate so I started putting stickers all over it. 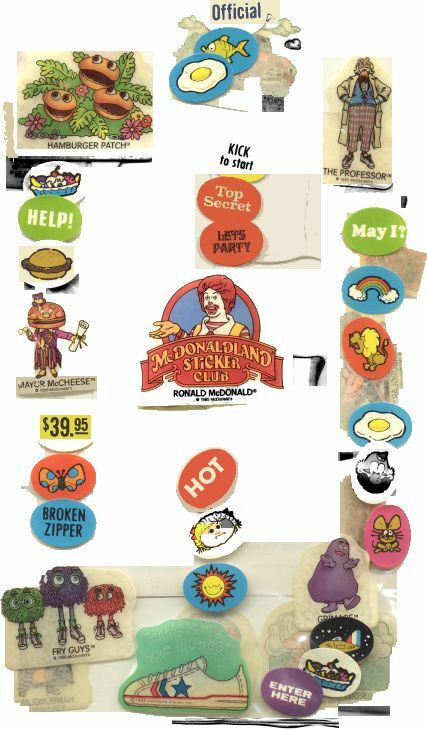 My favorites of this group are probably all the McDonaldLand stickers. In the center and in the corners on the left as well as the corners on the right. 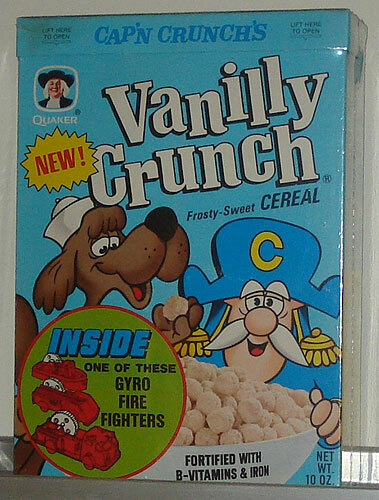 You’ll see forgotten characters like The Professor, The Captain, The Fry Guys, and Officer Big Mac. As well as stalwarts The Hamburglar, Birdie the Early Bird and Grimace. If I’m not mistaken, the Reese’s Pieces sticker on the right page is from a group of ET stickers. I’m not too happy with the hearts behind them, though. Okay, here are the actual first pages of the sticker album. We start off with some Michael Jackson puffy stickers. I loved MJ so you’ll see a bunch of those (and of course, these are puffy). There is also an Orko (puffy!) on the left and two Ghostbusters stickers under that. The red and white “Mi” sticker is from a company my dad worked for, Motion Industries. The black and gold Racing Team sticker is taken from a remote control Smokey and the Bandit Firebird. You can see the top and bottom stickers from the Rubik Missing Link puzzle. On the right you can see a bunch of generic 80s “exclamation” stickers. Good Show! Fantastic! Dynamite! Super! I have no idea where those came from. Or the giant ice cream cone (the hell?). 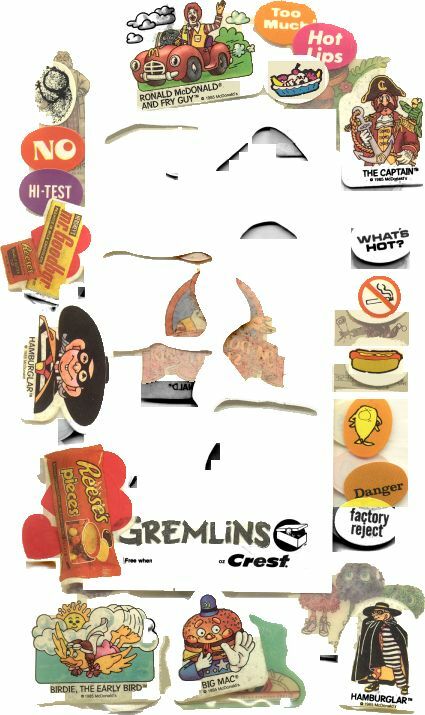 The two rectangle stickers in the upper right came from the Cracked Monster Party magazine. The tennis ball stickers came from my parents. They were avid tennis players when I was growing up. 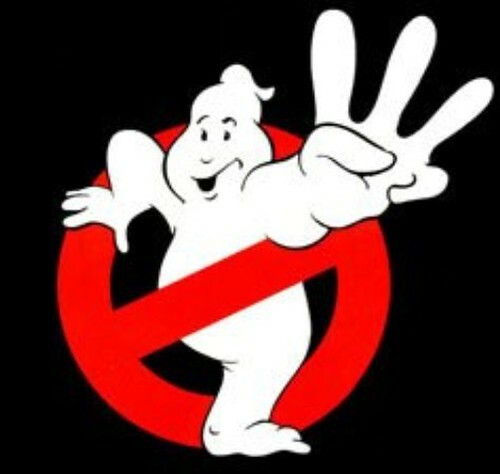 Ghostbusters 25th Anniversary; New Video Game, New Movie, but no new books? So, this year is the 25th Anniversary of the movie Ghostbusters. Released in 1984, it has become a comedy classic. There has been much buzz recently about the Ghostbusters franchise and several announcements and product releases that have got “Ghosties” (Ghostbusters fans) excited. 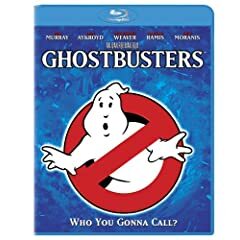 On June 16, the first Ghostbusters movie was released on Blu-Ray. Also on June 16, a new video game called, appropriately, Ghostbusters: The Video Game was released for all the next generation console systems. One of the things about this video game that excited fans of the movie was that it reunites most of the cast from the original movie for the first time since Ghostbusters II in 1989 (which was also released on June 16). Returning to voice their characters are Harold Ramis (Egon Spengler), Dan Ackroyd (Ray Stantz), Ernie Hudson (Winston Zedmore) and even Bill Murray (Peter Venkman). Also returning for the game are Annie Potts as Janine and William Atherton as Walter Peck. Sigourney Weaver and Rick Moranis turned down the opportunity to return to voice their characters. 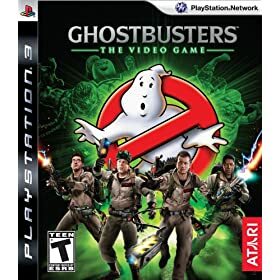 Ramis and Ackroyd wrote the script for the game and they both said that they treated the development of this game as if they were making a new Ghostbusters movie. Judging by online reviews, that commitment shows in the game’s play and storyline. I look forward to playing it on the PS3. When the actors reunited to voice their characters for the game, Bill Murray was quoted as saying he had a great time re-visiting the character of Venkman and working with his friends Ramis and Ackroyd. He also said he would consider returning to the Ghostbusters franchise in a new movie. That was big news as Murray has continually said for years that he would never do another Ghostbusters movie after the studio made so many changes to Part 2 that it was no longer the movie he signed on to make. Needless to say, Ramis and Ackroyd are in active development of a new Ghostbusters movie. Hopefully, it happens, I would love to see the group back together again.